On some dates we will combine Island Hopping in Kvarner Bay with a full-day kayak trip to the Zrmanja Canyon, near Obrovac. During the kayak safari you will be accompanied by a qualified kayak guide – no specific experience and knowledge are required. 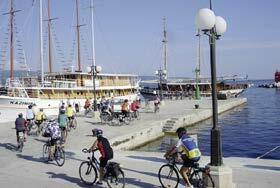 From 11:30 am to 1:00 pm, boarding time in the port of Rijeka, our bicycles are awaiting you already on board. If you arrive by your own car, you can proceed to the port already from 10:00 am. Our service-team will lead you to the garage where you can leave your car. Of course, they will also bring you back to the port. After embarkation, our representatives and guides will welcome you aboard with a drink and you will meet the crew and your fellow passengers. After a lunch snack “Cast off!”, heading towards Malinska on the island of Krk. Here starts the first bicycle stage – from Malinska, across Sv. Anton, Nenadići and Vrh, to Krk, the capital of the homonymous island. Dinner and overnight stay in Krk (22.7 km by bicycle). The boat takes us from Krk to Lopar, in the north of the island of Rab. Our bike tour leads us from Supetarska Draga over Kampor to the city of Rab, while our boat will be already waiting for us in the picturesque scenery of the old town of Rab with its four unique bell towers. Lunch will be served aboard. 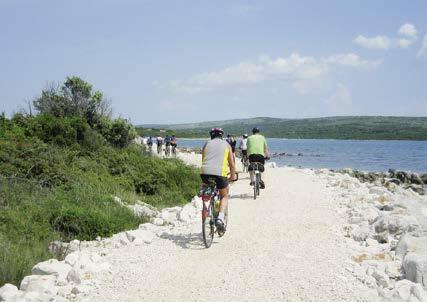 After lunch, we will go by bike for another tour, passing the places Barbat, Pudarica and Mišnjak and then all the way back to Rab again. There you will have the opportunity to visit a restaurant for dinner. Overnight stay in the harbour of Rab (45 km). Only a good half hour by boat and we will reach Lun, at the northern tip of the neighbouring island of Pag. The island stands out above all by its extremes – partly meagre, like a lunar landscape, partly covered with lush green mountain fields, where numerous sheep graze, “producing” the famous Pag cheese. First we will ride to Novalja, the main town of the northern half of the island, where you can have lunch at a restaurant or in a tavern. We then continue to Kolan and finally Mandre, where our boat will be waiting in the harbour. Dinner and overnight stay in Mandre (33.8 km). After breakfast, we will go by bus to the river Zrmanja. There, we will take over our kayaks, and paddle downstream via waterfalls (in case of very high tide, instead of kayaks, we will use inflatable rafts – rafting). At lunchtime we will enjoy a picnic and a swimming break – try the unforgettable experience of swimming in the crystal clear river water, right under the waterfalls… we then will paddle through the Zrmanja Canyon with its beautiful scenery and spectacular bird life. Bus transfer to Zadar, where we board our ship again. 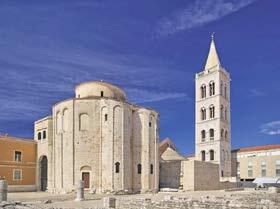 Afterwards you are invited to enjoy a guided tour through the historic town of Zadar, which is surrounded by impressive walls and offers numerous sights and secrets to discover. Dinner and overnight stay on board. Today a somewhat longer boat journey lies ahead of us – about four hours from Mandre to Mali Lošinj on the island of Lošinj. Heading south, we anchor for lunch in a bay of one of the small islands south of Lošinj. On arrival at the port of Mali Lošinj, we unload our bicycles to discover the unique richness of the local nature with its vast pine forests. We ride round the Čikat Bay, along the coast and through the Sunčana Uvala (the Sunny Bay) to the picturesque harbour town of Veli Lošinj. Here you can enjoy a nice dinner in one of the numerous restaurants of Mali Lošinj. 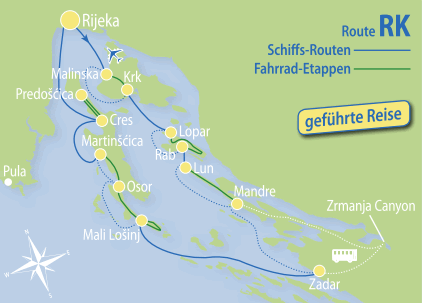 Overnight stay in Mali Lošinj (18.3 km). The “2-Islands-Day”. 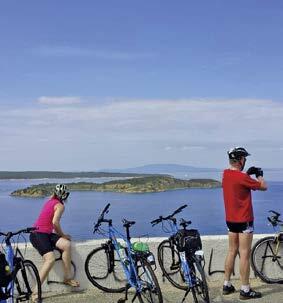 After breakfast, we will jump on our bikes and ride from Mali Lošinj over Nerezine to Osor, where the islands of Lošinj and Cres are connected by a pivot bridge. Through Belej and Stivan we reach the Bay of Martinšćica. We load the bikes on the boat and continue to the town of Cres, the capital of the island. We will have lunch during the tour on the island of Cres (not included); dinner and overnight stay at the harbour of Cres (45.1 km). 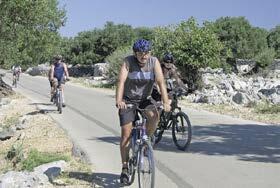 The final bike tour leads us from Cres 14 km north to a vantage point in the village of Predošćica and back. We will have lunch in Cres (not included), and then upload our bicycles for the last time. Leaving the harbour of Cres, we will sail to a bay in the north of the island to take the last long swim in the blue Adriatic Sea, before returning to Rijeka. Dinner and overnight stay in Rijeka (28.4 km).